Sir, knowing how doubtfully all allegories may be construed, and this booke of mine, which I have entituled the Faery Queene, being a continued allegory, or darke conceit, I have thought good, as well for avoyding of gealous opinions and misconstructions, as also for your better light in reading thereof, (being so by you commanded,) to discover unto you the general intention and meaning, which in the whole course therof I have fashioned, without expressing of any particular purposes or by accidents therein occasioned. I labour to pourtraict in Arthure, before he was king, the image of a brave knight, perfected in the twelve private morall vertues, as Aristotle hath devised, the which is the purpose of these first twelve bookes: which if I finde to be well accepted, I may be perhaps encoraged to frame the other part of polliticke vertues in his person, after that hee came to be king. To some, I know, this methode will seem displeasaunt, which had rather have good discipline delivered plainly in way of precepts, or sermoned at large, as they use, then thus clowdily enrapped in allegorical devises. But such, me seeme, should be satisfide with the use of these dayes, seeing all things accounted by their showes, and nothing esteemed of, that is not delightfull and pleasing to commune sence. For this cause is Xenophon preferred before Plato, for that the one, in the exquisite depth of his judgement, formed a commune welth such as it should be, but the other in the person of Cyrus and the Persians fashioned a government, such as might best be: so much more profitable and gratious is doctrine by ensample, then by rule. …much more profitable and gratious is doctrine by ensample, then by rule. So have I laboured to doe in the person of Arthure: whom I conceive, after his long education by Timon, to whom he was by Merlin delivered to be brought up, so soone as he was borne of the Lady Igrayne, to have seene in a dream or vision the Faery Queen, with whose excellent beauty ravished he awakening resolved to see her out, and so being by Merlin armed, and by Timon thoroughly instructed, he went to seeke her forth in Faerye Land. of affayres orderly as they were donne, accounting as well the times of the actions; but a poet thrusteth into the middest, even where it most concerneth him, and there recoursing to the things forepaste, and divining of thinges to come, maketh a pleasing analysis of all. The beginning therefore of my history, if it were to be told by an historiographer, should be the twelfth booke, which is the last; where I devise that the Faery Queene kept her annuall feaste dayes, uppon which severall dayes, the occasions of the several adventures hapned, which being undertaken by severall knights, are in these books severally handled and discoursed. The first was this. In the beginning of the feast, there presented him selfe a tall clownish younge man, who, falling before the Queen of Faries, desired a bonne (as the manner then was) which during the feast she might not refuse: which was that hee might have the atchievement of any adventure, which during that feaste should happen: that being graunted, he rested him on the floore, unfitte through his rusticity for a better place. Soone after entred a faire ladye in mourning weedes, riding on a white asse, with a dwarfe behind her leading a warlike steed, that bore the armes of a knight, and his speare in the dwarfes hand. Shee, falling before the Queene of Fairies, complayned that her father and mother, an ancient king and queene, had bene by an huge dragon many years shut up in a brasen castle, who thence suffred then not to yssew: and therefore besought the Faery Queene to assygne her some one of her knights to take on him that exployt. Presently that clownish person, upstarting, desired that adventure: whereat the Queene much wondering, and the lady much gainsaying, yet he earnestly importuned his desire. In the end the lady told him, that unlesse that armour which she brought would serve him (that is, the armour of a Christian man specified by Saint Paul, vi. Ephes. ), that he could not succeed in that enterprise: which being forthwith put opon him with dewe furnitures thereunto, he seemed the goodliest man in al that company, and was well liked of the lady, and eftesoones taking on him knighthood, and mounting on that straunge courser, he went forth with her on that adventure: where beginneth the first booke vz. A gentle knight was pricking on the playne, &c.
The second day ther came in a palmer bearing an infant with bloody hands, whose parents he complained to have bene slayn by an enchaunteresse called Acrasia: and therfore craved of the Faery Queene, to appoint him some knight to performe that adventure; which being assigned to Sir Guyone, he presently went forth with that same palmer: which is the beginning of the second booke and the whole subject thereof. The third day there came in a groome, who complained before the Faery Queene, that a vile enchaunter, called Busirane, had in hand a most faire lady, called Amoretta, whomehe kept in most grievous torment, because she would not yield him the pleasure of her body. Whereupon Sir Scudamour, the lover of that lady, presently tooke on him that adventure. But being unable to performe it by reason of the hard enchauntments, after long sorrow, in the end met with Britomartis, who succoured him, and reskewed his love. But by occasion hereof, many other adventures are inermedled, but rather as accidents than intendments: as the love of Britomart, the overthrow of Marinell, the misery of Florimell, the vertuousness of Belphœbe, the lasciviousness of Hellenora, and many the like. 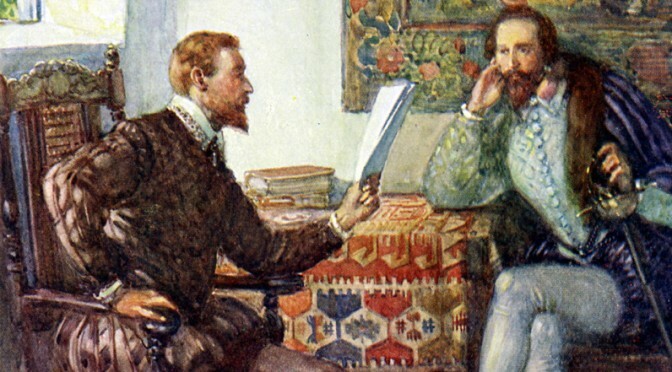 Thus much, Sir, I have briefly overronne, to direct your understanding to the wel-head of the history, that from thence gathering the whole intention of the conceit, ye may, as in a handful, gripe al the discourse, which otherwise may happily seem tedious and confused. So humbly craving the continuance of your honourable favour towards me, and th’ eternall establishment of your happiness, I humbly take leave. “Spenser not only creates a world in his Faerie Land and peoples it with characters who engage our imaginations, but also mirrors our own world and show us ourselves. Those characteristics can be seen n the way that The Faerie Queene, 400 years after the publication of its first three books, still holds the attention of readers, even those unfamiliar with, and uninterested in, the historical events that inform so much of the poem. The value of The Faerie Queene rests not just in the beauties and intricacies of Spenser’s poetry, not just in historical allegory, or even its superb moral coloration. Rather… its value rests on Spenser’s ability to draw us into his work, not just to appreciate and understand it, but to learn from it and to grow to a better understanding of the human condition. 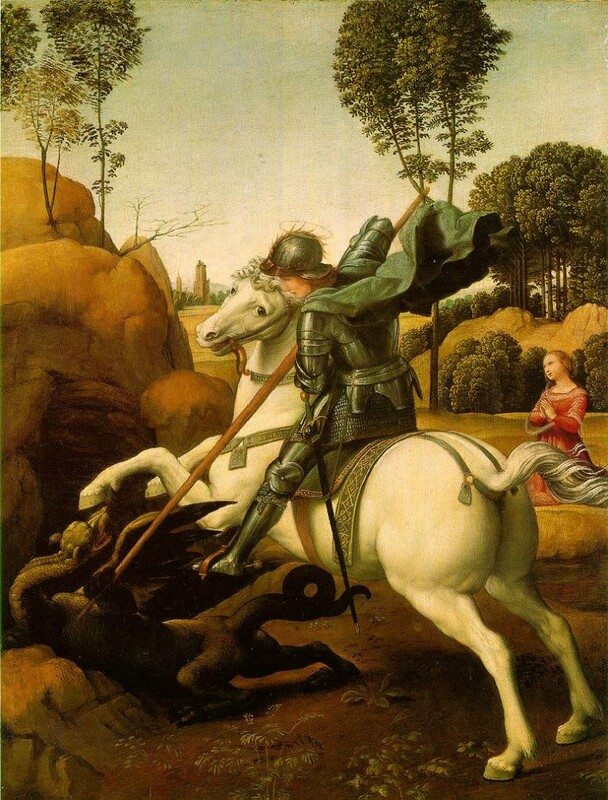 Saint George and the Dragon. Raphael. 1504-1506. 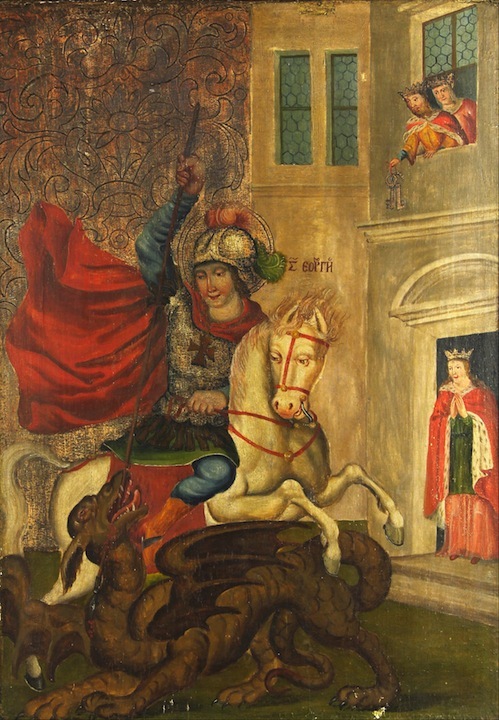 St. George the Victorious. Artist Unknown. The Faerie Queen is growing on me—or I am growing into it. More and more frequently my mind is wrestled into the dim loveliness of Spenser’s world. I feel my thoughts tuned to its archaic cadence, its ordered beauty, its “actual avenging virtue.” This is not a passive or a tranquil world. But it is beautiful. I recently dreamed I had a daughter called Gloriana. That is the only time in my memory that I’ve dreamed the name of a future family member. Now I’m seriously considering the Faerie Queen’s appellation for my offspring. Fierce warres and faithfull loves shall moralize my song. In spare moments I am reading the Faerie Queen for the first time. At the slow but steady rate of one canto per month I find myself apparently occupied for the next six years, and happily so. So much have I enjoyed reading, taking notes, and looking at illustrations, that I have started collecting and archiving my efforts here. May it be a help to you on your way to Goodness, Beauty and Truth. Unless otherwise noted, the content of this website is original to the author and protected by copyright law. Personal and family use is permitted, but please contact the site administrator for permission to use this material with the wider community. Thank you for your integrity in this matter.